A solid-liquid suspension is spun in a cylindrical chamber (figure 43) at an angular velocity w (rad · s–1). The average distance separating the particle from the rotation axis is radius R (in m). g = 9.81 m · s–2. In practice, it is easier to use revolutions per minute-1 as the unit of rotation speed N.
Industrial machines will generate centrifugal fields of 2,000 to 4,000 g in water treatment applications. dL = the interstitial liquid’s density. 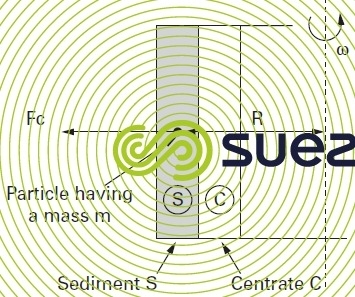 It is therefore clear that if the particle is subjected to a centrifugal force outside the liquid ring, the forces applied to the particles will be higher.